Calling All Grab-n-Go Breakfast Recipes! Happy Tuesday! Actually, poor Tuesday… Tuesday always gets picked on. It’s not Monday, that you bond with people over whining about, but you’re not yet at mid-week, and you are closer the the previous weekend then new one coming up. However, one thing that can make Tuesday start off on the right foot? 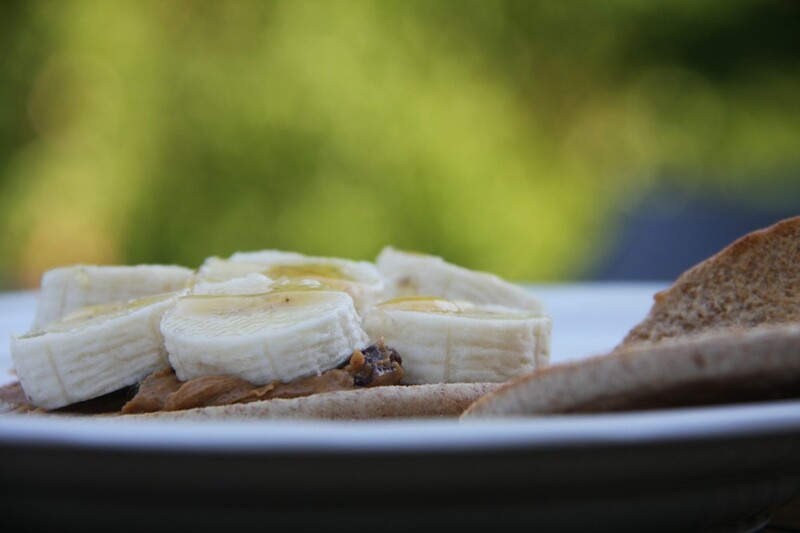 Peanut Butter, Banana and Honey. Trust me, I know this first hand! PB&Co Cinnamon Raisin Swirl… amazing. Although I noticed I seem to go through peanut butters and heck of a lot slower than other people… in the words of Jerry Seinfeld… What. Is Up. With Thaaat?? Speaking of breakfast helping the day get off to a good start, I need some help with Hubbs. He gets up *before* the crack of dawn. I know there are a lot of early risers out there, so I’m asking for your help. 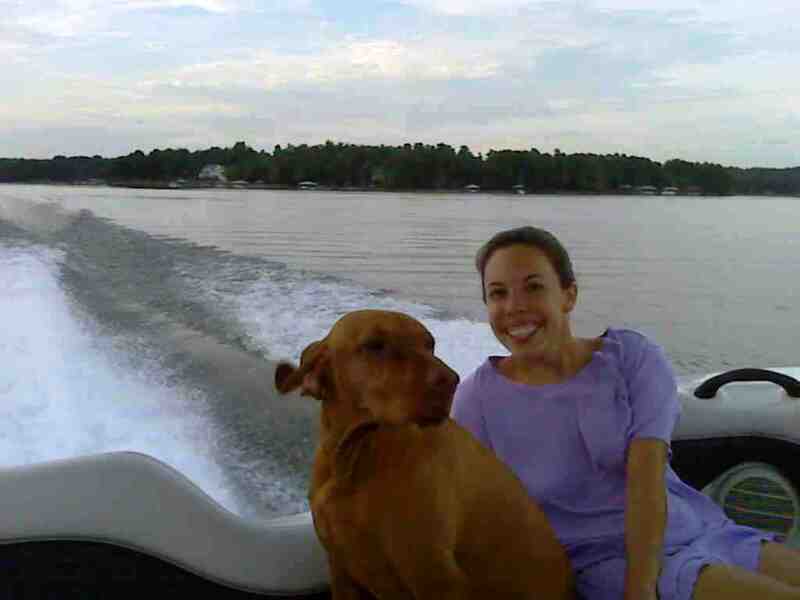 He will get up at 5:30am and is out of the house by 6:00am. The good news is he eats breakfast. The bad news is that it is a Hot Pocket Egg, Bacon and Cheese Pocket…which we all know is about as healthy and natural as a banana runt being called a fruit. Since he has about an hour drive, he needs something quick, easy and that he can eat on the road (so no oatmeal, cereal, etc). 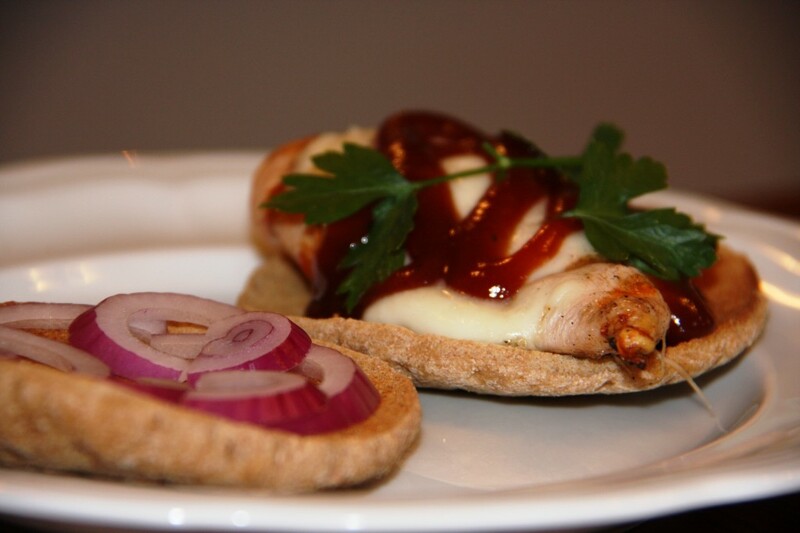 Do you know of any recipes that I could make and freeze, that he could reheat on his early mornings? 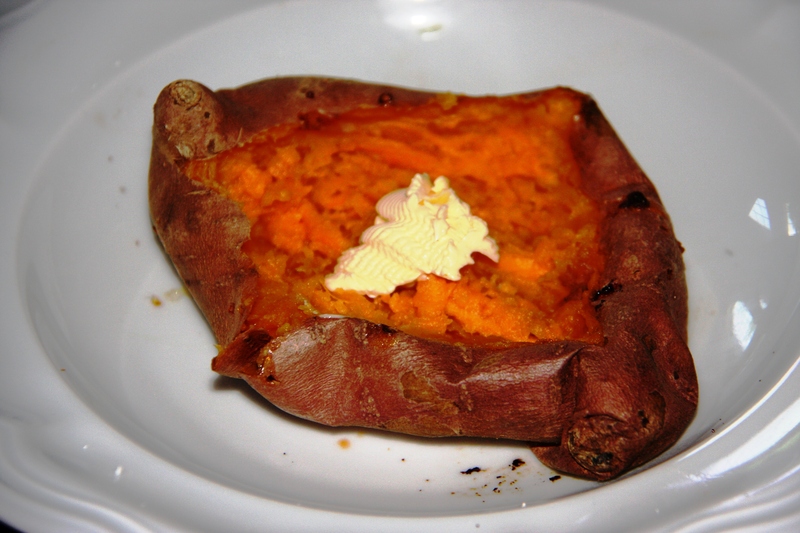 Almost like a healthy version of a Hot Pocket? Any suggestions, recipes or ideas would be very much appreciated! I really appreciate the breakfast ideas. I’m toying with the idea of trying to create my own version on Amy’s frozen breakfast burritos. I’m a little nervous about how eggs will be when frozen and reheated, but I guess the only way to find out is to give it a go, right? I know Hubbs wouldn’t be thrilled with the idea of overnight oats (and I’m not sure how I even feel about them since I’ve never tried them), but I know he likes breakfast burritos! What about muffins? Any high protein muffin recipes out there? 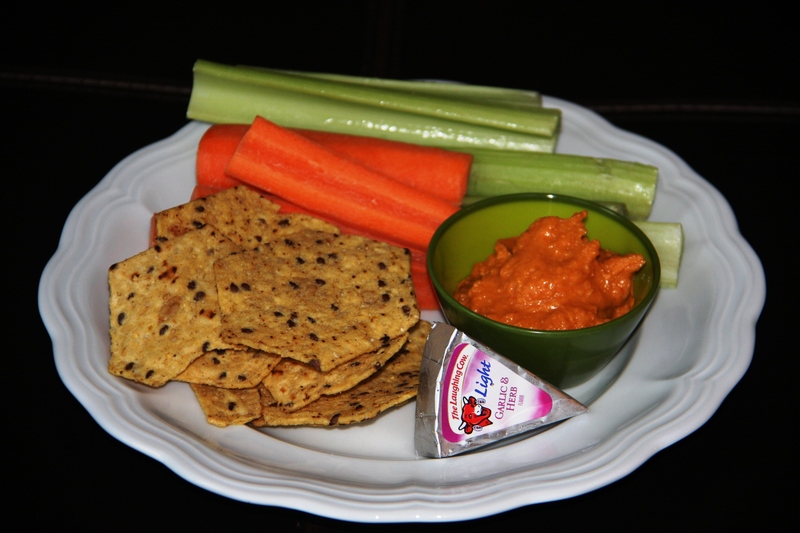 Carrots, celery, red pepper hummus, Food Should Taste Good chips and Laugh Cow. 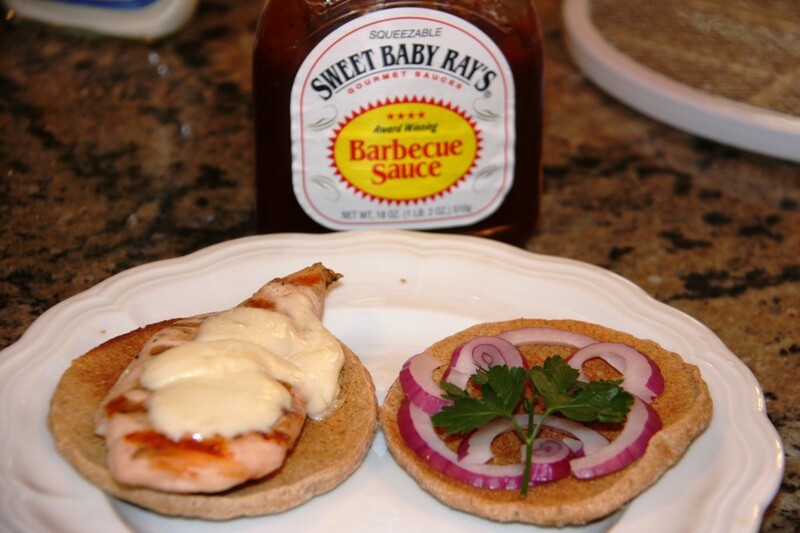 Topped with a bit of Smart Balance light butter. 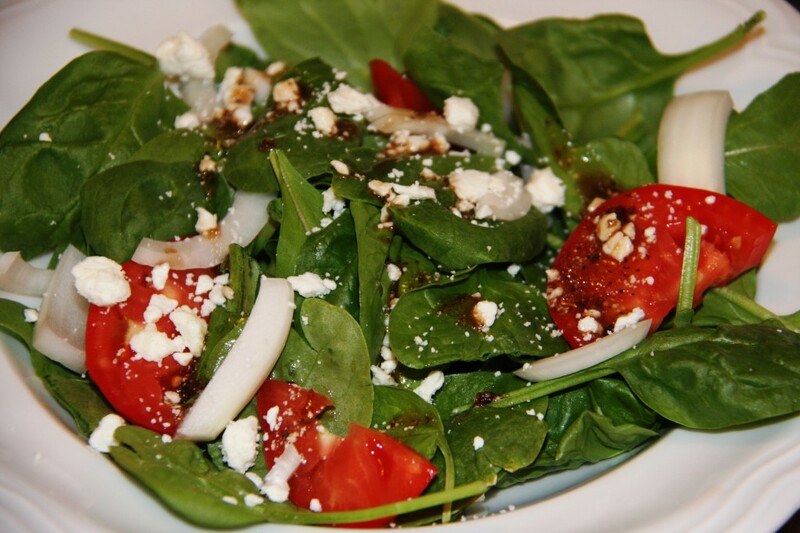 And a side salad of arugula, spinach, tomato, onion, sprinkle of feta and a drizzle of Newman. I haven’t had arugula in a long, long time. I’m not even sure what drove me to throw it in the grocery cart, but I’m glad I did… it added some spice to my salad! , an unpictured slice of cheddar and a handful more of Food Should Taste Good tortilla chips made up my afternoon snackage. 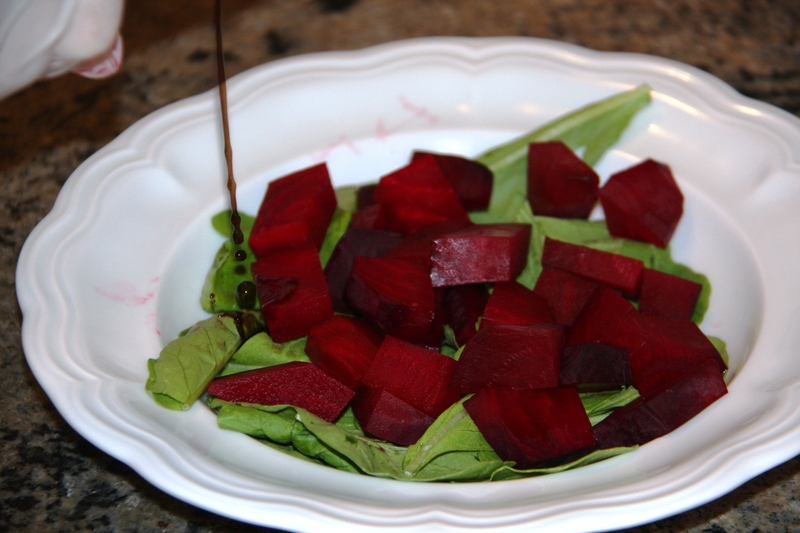 For dinner, I decided to try something I’ve never had before… beets! 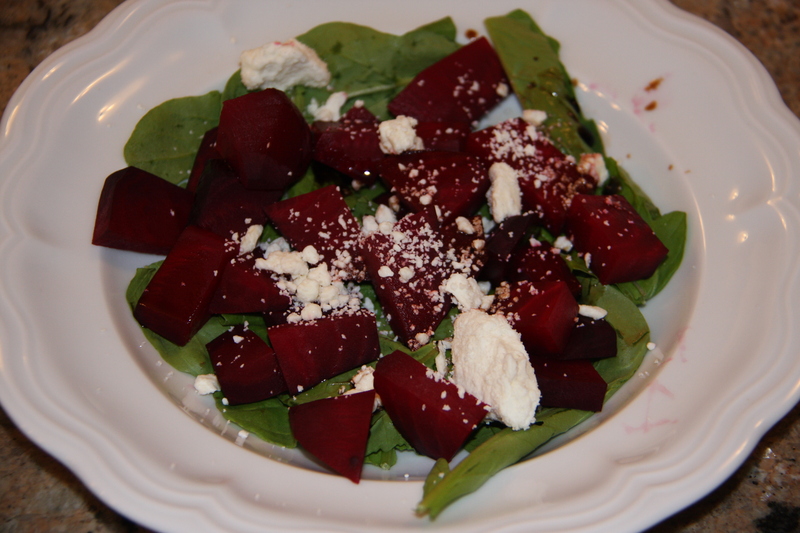 A friend of my husband emailed me a simple beet recipe, that was beets, feta and balsamic vinegar… easy enough, right? 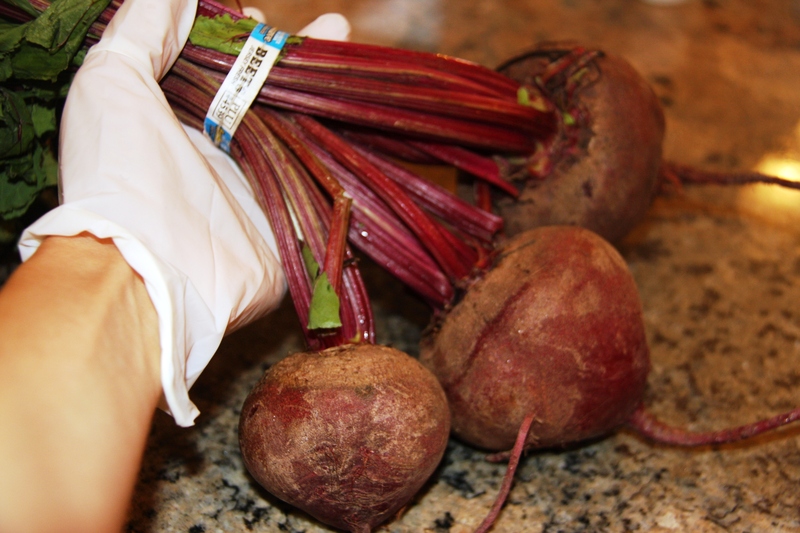 Don’t mock my gloves… I heard beets stain, and despite their beautiful color, I didn’t want my hands sharing the same reddish shade. I cut them in half and popped ’em in the oven at 350 for 30 minutes. They came out looking kinda crazy… especially this one, which freaked Hubs out! Check out that HOT pink… so crazy. I cut off all the edges, and threw the pieces in a bowl with arugula and topped with balsamic and feta. 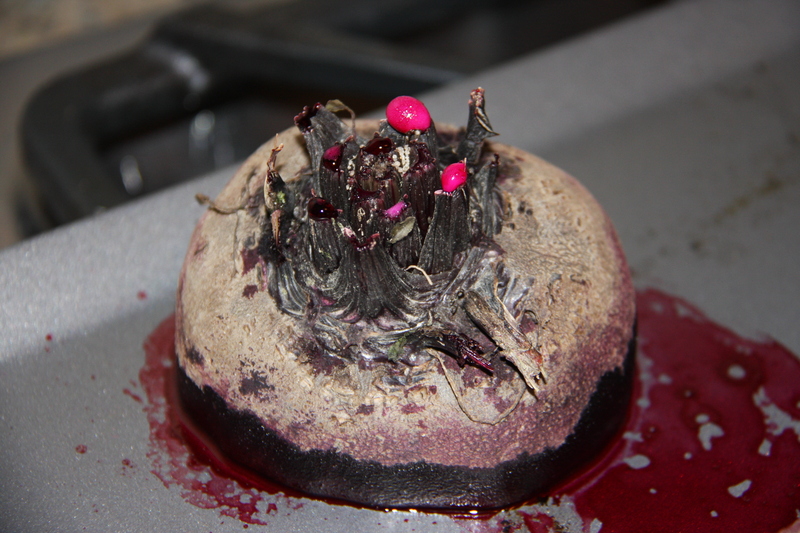 The flavors tasted fine, actually pretty good, but I am thinking I didn’t cook the beets long enough. They were very crunchy. Are they supposed to be? I thought it tasted good, especially with the arugula, feta and balsamic, but Hubbs said we need to declare it a D.O. (Do Over). Are beets supposed to be crunchy or soft?! 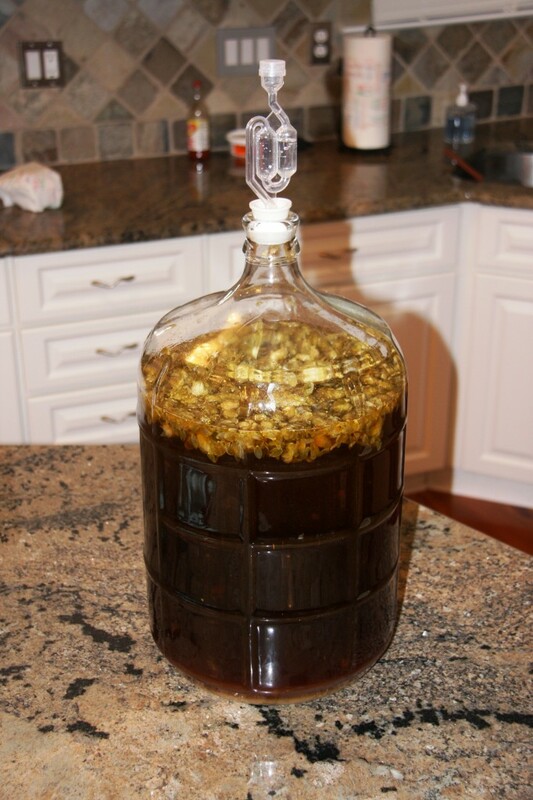 Tonight is bottling night for Hubs’ 2nd homebrew… it’s going to be a very hoppy beer! Thank you everyone for your breakfast ideas! 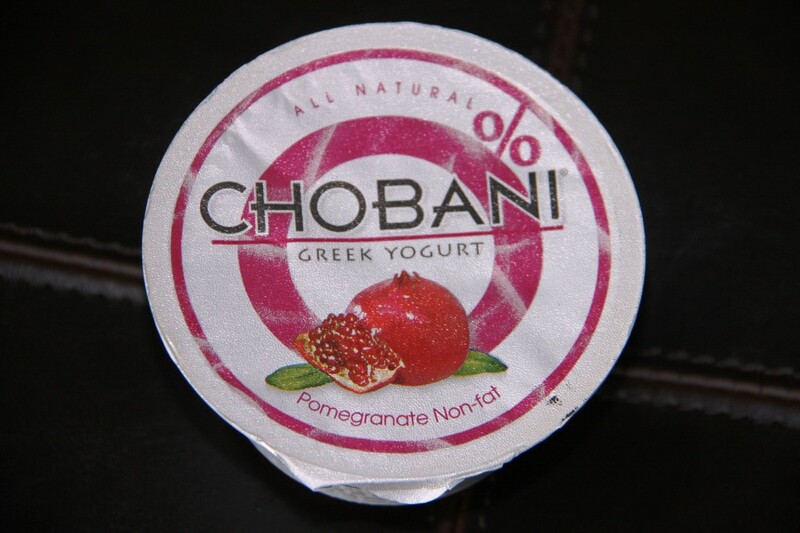 I’m going to experiment in the next few days with a freezable breakfast… stay tuned to see how it goes!! I’m thinking I’ll make the egg strata things that Kristin suggested and put them in a wrap? Or maybe try the muffins that Shawnee suggested… lots of good ideas to chose from! Sometimes a make a semi-large batch of eggs, vegetarian sausage and black beans in a bowl and keep it in the fridge. Then I buy these tortillas that the Whole Foods I work at makes IN HOUSE (yum!) that are whole wheat and small, and I’ll wrap and heat that throughout the week. Fast, filling and healthy. I know that’s not a freezer recipe but it lasts. I have heard you can refrigerate eggs. Haven’t personally tried it. I love overnight oats. You make your oatmeal at night and grab it on the way out the door in the morning. Amazing. I eat the same thing every morning…No help here! I’ve made breakfast burritos before and froze them! Scramble up some eggs, black beans, bacon/sausage, whatever and then fill tortillas with it and wrap ’em up. Wrap the burritos up in plastic wrap and then place in a freezer ziploc bag. Freeze them. When he’s ready to eat them he can take one out, unwrap the plastic, wrap the burrito in paper towel and microwave for 1-2 minutes (depending on the size/thickness). They’re actually not that bad…just make sure you undercook the eggs a little so they don’t get rubbery during microwaving. 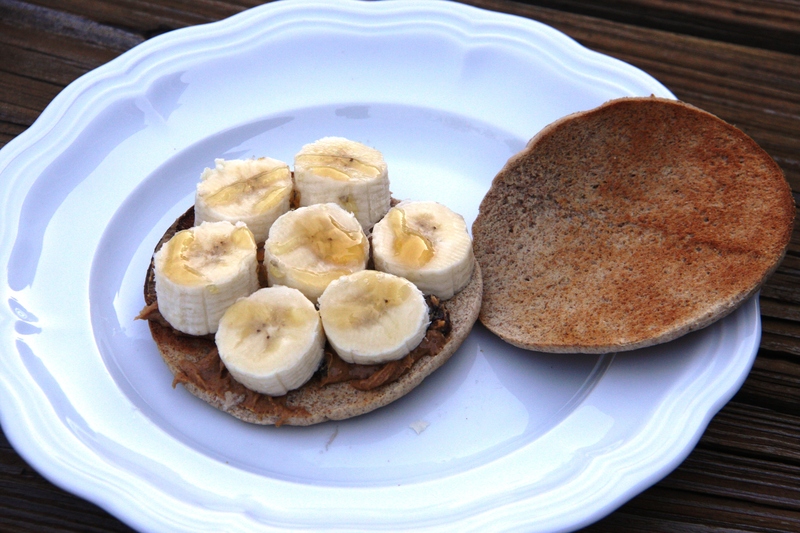 What about hardboiled eggs with an english muffin or bagel with pb or all natural fruit spread on it? Protein from the eggs and a portable carb + fat too. I think eggs would probably not freeze too well. I think they would get really watery as they defrosted. My husband has the same dilemma. Except he frequents McDonald’s… which is probably worse! I have a wonderful idea. 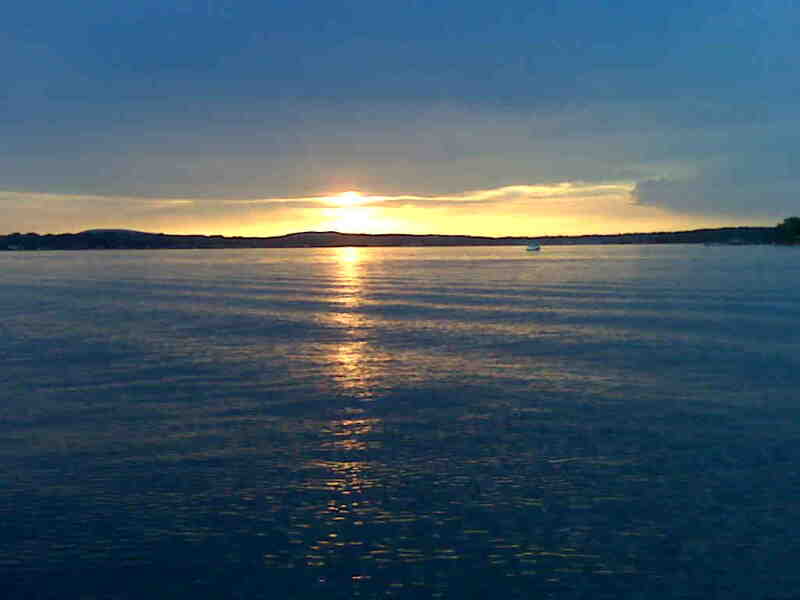 Well I think it’s wonderful! 😛 I’ve seem recipes for chicken muffins. Basically it’s a wholewheat muffin with cooked chicken, carrots, peas, or whatever. It’s kind of like a chicken pot pie type of thing. Well, I’ve been day dreaming about making up one of these, but with scrambled eggs, cheese and maybe some hame or lean bacon. You oculd make the muffins with apple sauce instead of oil, to cut down on the fat. I’ve never done this, only have I been thinking about it. But you could freeze them! Good luck. 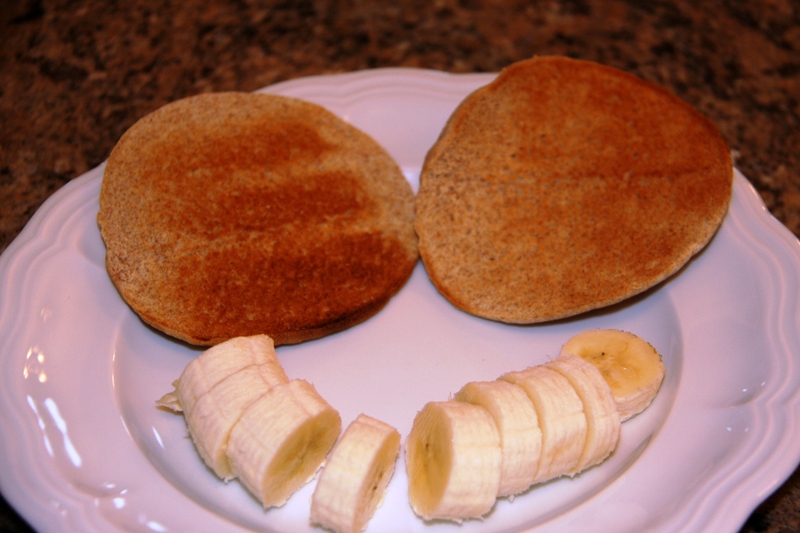 I love the smile from your banana and bread! I’m not sure about the breakfasts…I’m totally interested to see what you come up with! I might have to steal the ideas! i LOVE BEETS!!! and i love that you wore gloves. you need to or it looks like a crime scene!